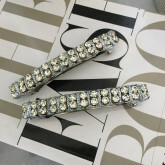 Sparkness clips is exclusively designed, handmade and made to order especially for you by Viktoria in Sydney, Australia. • This design is custom made to order, please allow 1 - 2 weeks for the making. Shipping is via express delivery. Our team will contact you to advise you of an expected completion date once your order is received. • Handmade double row vintage clear glass crystals finished with a luxe metallic in either a gold or silver braid.